No arrests have been made in an arson fire at a Delaware church last month. Delaware police say they are still investigating two fires at the Delaware Church of God at 185 Lake St. One was declared arson. Police said Monday that their investigation continues. The first fire occurred the morning of March 8. A passer-by called firefighters after seeing a fire at the church. Delaware Fire Chief John Donahue said crews were able to put out the fire and estimated the church had sustained $75,000 of damage. No one was injured. Fire officials said an electrical issue caused the first fire. Then on April 7, firefighters were summoned to the church again after receiving a report of smoke coming from the building. Donahue said the fire was small and caused about $500 in damage. Police Capt. Adam Moore said the second fire was “suspicious” and police detectives are investigating, along with fire investigators. However, Daniel Maurer, the pastor of the church and one of the chaplains for the Delaware Police Department, said in April that damages have reached “hundreds of thousands” of dollars and Maurer said the church would have to decide whether to rebuild. Maurer added the entire interior of the church was destroyed. Maurer said in April that the church owns several acres on U.S 36/State Route 37 and would have to decide between building a new church on that property or rebuilding on the current property. 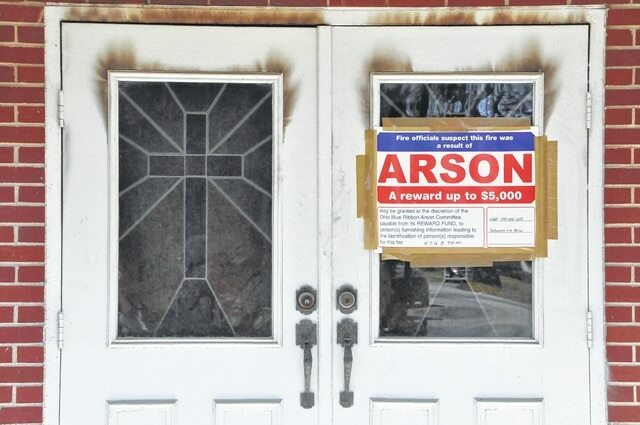 A notice was posted on the door of Delaware’s Church of God on Lake Street after an April 7 fire, stating that authorities believe the fire was the result of arson. http://aimmedianetwork.com/wp-content/uploads/sites/40/2016/05/web1_arson.jpgA notice was posted on the door of Delaware’s Church of God on Lake Street after an April 7 fire, stating that authorities believe the fire was the result of arson.